There’s something special about opening night for any professional sports team. The slate is clean, hopes are high and it’s the chance to set the tone for the season to come. When the Vancouver Canucks skate out for their season opener on Friday night against San Jose at General Motors Place, they’ll have the opportunity to reconnect with a passionate fan base that has been counting down the days to the new season since the last one ended on May 3rd in Anaheim. The Canucks can officially put their new uniforms on display and show off the new faces who’ll wear those colours this season. For all the ups and downs of the franchise over its 37 years of existence, the Canucks have been remarkably solid in season openers going 20-12-3-1. Friday will mark the 26th time the Canucks have opened a new season at home (although only 25 of those games have been played in Vancouver. The 1997 ‘home’ game was played in Tokyo). The Canucks are 14-8-3 when playing their first game of the year at home and are 5-2 in season openers played at GM Place. Friday’s game marks the eighth time – and third straight season – the Canucks have opened the year on October 5th. They are 4-3 on that date and have won the last two times they’ve played on that slot on the calendar. Two years ago the Canucks beat Phoenix 3-2 in Wayne Gretzky’s head coaching debut and last year the Canucks opened the season with a 3-1 win over the Red Wings in Detroit. Markus Naslund, Sami Salo and Trevor Linden scored the Canuck goals that night and Roberto Luongo gave Canuck fans a pretty good indication of things to come as he stopped 27 of the 28 shots he faced. Jeff Paterson is a Team 1040 broadcaster and a regular contributor to the Georgia Straight. The Canucks have won their past four season openers and the captain is a big reason why. Naslund has scored on opening night in four of the past five years including a two goal effort in that win over the Coyotes in 2005. A pair of goals is always an accomplishment, but it’s a far cry from the team record for goals in a first game of the season. Rick Blight opened the 1976-77 campaign with a four goal performance – including a club record three power play goals – in Pittsburgh on October 6, 1976. That feat was matched a dozen years later by Greg Adams who found the back of the net four times in his Canuck debut and the team’s first game of the 1987-88 season in an 8-2 win over St. Louis. The eight goals the Canucks scored that night equaled the club’s greatest offensive opening night output which had been established in an 8-2 win over the Colorado Rockies on October 11, 1978. The Canucks surrendered nine goals to Pittsburgh in a 9-5 loss to the Penguins in their first game of the 1976-77 season. The Canucks have faced 22 different opponents on opening night over the years ranging from Toronto starting the 1971-72 season and the Atlanta Flames kicking off the 1974-75 campaign at Pacific Coliseum and the New York Rangers opening the 1999-2000 season at GM Place to the Canucks opening in Boston (1973-74), at Madison Square Garden (1977-78) and in Philadelphia (2000-01) when the club began the year with a eastern swing that continued on to Florida and Tampa Bay before they played a home game. Of all the teams in the league, the Canucks have opened against Calgary more than any other opponent. It’s happened on five occasions with the Canucks posting a record of 3-1-1. Included in those games, the only opening night shutout involving the Canucks – Dan Cloutier stopped all 19 shots he faced in a 3-0 win at the Saddledome on October 10, 2002. A decade prior to that the Canucks started the season with a 5-4 win in Edmonton which kicked off the best start to any season in franchise history. The Canucks won their first four games that year – the only time they’ve ever gone 4-0 to open a season. By contrast, the longest the Canucks have ever had to wait to pick up their first win came after a lengthy wait to simply play their first game of the 1994-95 lockout shortened-season. It took the Canucks five games to record a victory that season 3-1 at St. Louis (although they did open the year with a 1-1 tie against Dallas on January 20, 1995). That January start date was, by far, the latest the Canucks have ever opened a season while the earliest they’ve ever played a game was October 2, 1999 when the Rangers came to town. 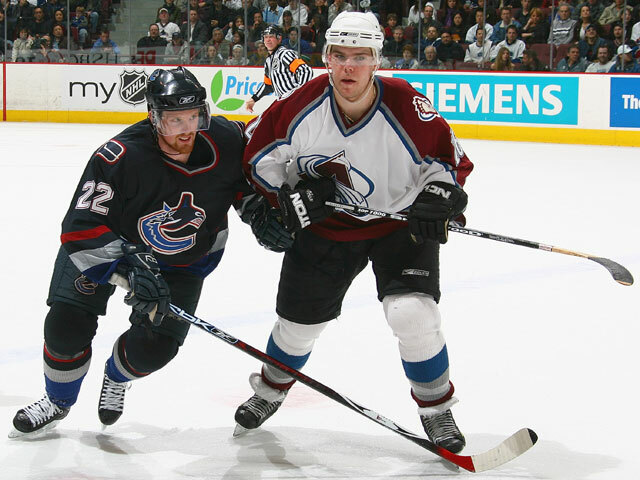 Both times the Canucks have gone to the Stanley Cup final they have started their seasons with a victory – 4-2 over Colorado on October 6, 1981 and 5-2 at Los Angeles on October 6, 1993. The only other time the Vancouver Canucks have faced the San Jose Sharks in their season opener was October 4, 1991 (San Jose’s first ever NHL game). The Canucks emerged as 4-3 winners at Pacific Coliseum – former Canuck tough guy and fan favourite Craig Coxe scored the first goal in Sharks history that night. 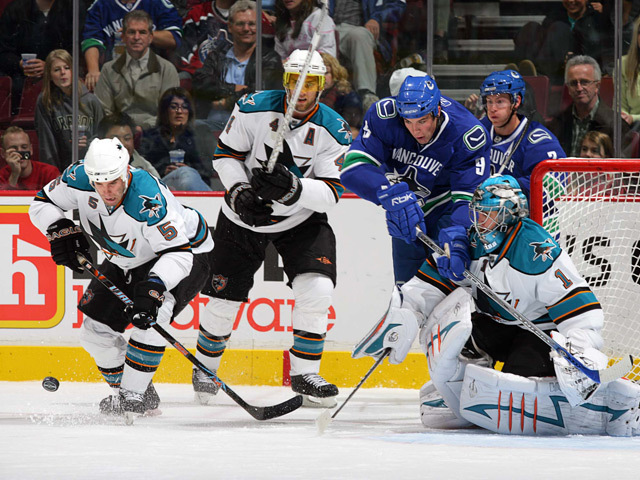 The Canucks beat the Sharks 5-2 the following night at the Cow Palace in San Francisco. What does any of this mean as the Canucks get set to start the 2007-08 season? Nothing really. But hopefully it’s helped you pass the time as we all wait for the drop of the puck on Friday night.